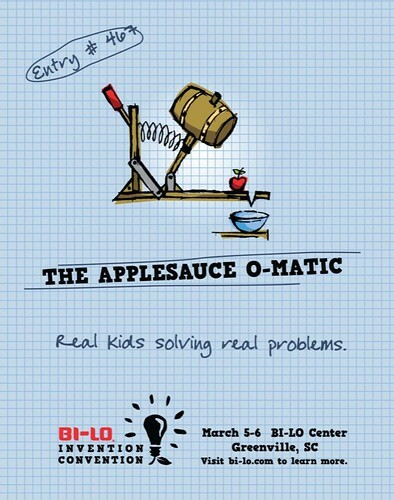 BI-LO, our grocery store client, sponsors an event every year called The Invention Convention. Basically it’s a science fair for midlle-school kids in Greenville County, except instead of homemade magnets and volcanoes, all of the entries are original inventions. The kids are asked to think up some useful device that solves an actual problem. And it has to be an invention they can actually make. So no flying cars or water-powered engines. All entries have to be real, practical, simple inventions. Last year the winner was a girl who invented a little pouch that held her insinulin monitor and hung discretely from her bra. Simple. Yet very cool. 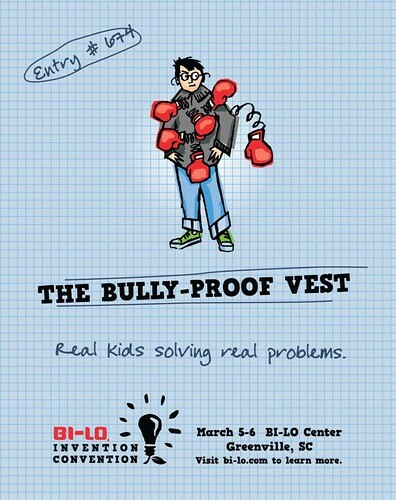 Our assingment was to create posters and billboards for the event. I worked with Chad Patterson, a great freelance art director and illustrator. 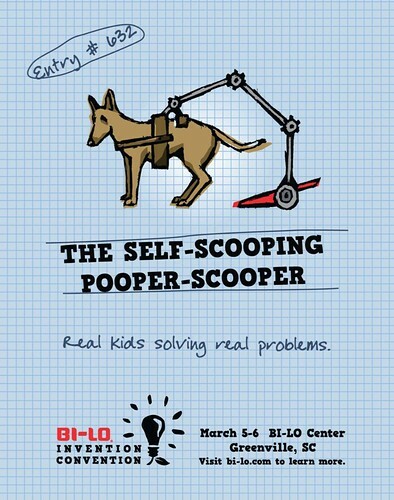 We thought it would be fun to show what kind of inventions could potentially be entered in the contest. The three executions that comprise the posters are our favorites from the list. Remember, this is advertising to kids and their parents, so we weren’t going for high-brow humor. It was a fun assignment. And here are the billboards.